I could have saved € 31,500 by buying the crocodile velour jacket that I tried on at the Hermès sale yesterday. Marked down from € 64,000 to €32,500, it was a real bargain and looked fantastic! But not being in such a thrifty mood, I decided to save less money by buying a couple of the square scarves that were € 165 instead of the normal price of € 292. And after waiting in line for about 30 minutes before I could even touch them, I wasn't about to go away empty handed. Do I need an invitation to attend the Hermès sale? No, I received an email about the sale but didn't need an invitation. At the door, however, the security guard will ask if you have any Hermès products in your purse so that they can write an attestation for the item to show to the security guard when you leave. Are the Hermès sales at the Hermès stores? No. I guess that Hermès thinks that their stores would lose some of their cachet if they were decorated with sale signs, so the sales are always held off site at the Palais des Congrès in Neuilly. Métro Porte Maillot. What kind of items are on sale? This was the clearance sale of the winter line, so there were sweaters, coats, hats, slacks, blazers, jeans, skirts, jackets, scarves, bags, bracelets, necklaces, shoes, boots, and ties. Should I plan to go on the first day? Unless you want to buy some special shoes or a purse, I don't think that it's necessary because one of the saleswomen assured me that they replenish their stock every day. She recommends going on Thursday afternoon because the lines are usually not as long as the lines on the first day. What should I do when I find a scarf that I like? Grab it before someone else does! 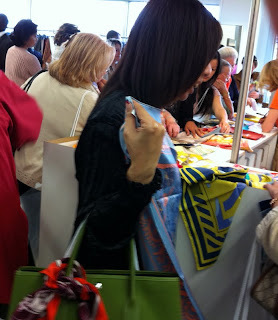 But more seriously, after selecting a scarf (or two), give it to one of the saleswomen who will put it in an envelope. She'll give you a voucher to exchange for your scarf when you pick it up at the cash register. Larger items may be placed in the plastic shopping bags. Is there a limit to the number of items that I can buy? Yes. You may purchase up to 10 square (carrés) scarves and 10 ties. Other articles are limited to five pieces of the same item, with the exception of leather bags (1), leather toiletry bags (4), belts (1), and small leather goods (2). Can I pay with my credit card? Yes, they'll also accept the deed to your house, your plane ticket home, and permanent indenture-ship. I suspect that's what happened with the British saleswoman with whom I spoke because she gave me some good advice based on what she used to do when she attended the sale as a customer rather than as an employee. She's probably working there to pay off the crocodile jacket that she bought at the last Hermès sale. The dates for the current Hermès sale are June 22-25 and June 27 from 9:00 am to 6:00 pm. Related post: A Hermès Scarf for € 1! hmmm, I wonder where the Chicago Hermes sale is held. I did catch the moving sale last year here, and it was a good one. They do have a strange and severe door policy though--you must leave after paying, no more browsing is allowed. They seem overly concerned about shoplifting. Joseph, All of the security devices attached to the crocodile jacket made it almost impossible to try on. Hermes also seemed to be extremely concerned about shoplifting in Paris with security checks both at the entrance and exit. Interesting to know that it's the same in Chicago. Please let me know if you find out where they hold their sale. Sara, after all of the trouble that we had flying to Boston in December, there's no way that I would have exchanged my ticket for a scarf, even an Hermès one! Hi, Any idea what are the dates for the June 2012 sale? As far as I know, the sale dates haven't been released yet but I'll post something as soon as I find out. I'm still waiting for official confirmation but I heard that the sale will start on July 4. Great article! Thanks for the entertainment.....now, I am curious about the Charlotte, N.C. sale at SouthPark. Huh, I wonder why Thursday afternoon in particular is a time when the lines are the shortest. I understand the first day of the sales and perhaps a weekend and Wednesday being busy times, but why Thurs afternoon? Qui sait! Do you know when is the special mark down sale this year? Please tell me soon, if you get any news about Hermes.